There is a small story of one success in front of you. It is the life of a university family that has successfully gone through trials of war, evacuation and rebirth in the exile. Let me thank everyone who stepped along this path full of patience, hopes, challenges and achievements together with the University. Today Vasyl’ Stus Donetsk National University is an open academic community of international level, which functions based on the principles of university autonomy. It is a leading center of education, science and innovations, while providing for the community needs of highly skilled professionals. We are confidently taking the leading position in the market of educational services of the Central Ukrainian region, enrolling over 2500 students for two straight years. I sincerely thank students of Vasyl’ Stus Donetsk National University and their parents for their trust! Vasyl’ Stus Donetsk National University became one of the most active partners of local self-government and business, creating a highly skilled expert environment. Despite the difficulties, we continue to improve our infrastructure. The number of University buildings and equipped classrooms, laboratories, computer classes, reading rooms is growing. A student coworking center has been opened. We are working on creating an science campus that will provide prospects for living, working, studying, self-realizing, while providing space for creativity and further self-improvement of the team. We are repaying debts. The initiative to give the university the name of our graduate Vasyl Stus was not destined to be implemented in Donetsk in 2008 — 2009 but came into force in 2016 at the birthplace of the poet, human rights defender and the Hero of Ukraine. Vasyl’ Stus Donetsk National University is a university family with its own corporate spirit, which lives on the principles of academic integrity, collegiality, humanism and student-centered learning. Active international cooperation, which is an integral part of the life of the University, provides the important role of Vasyl’ Stus Donetsk National University as a participant in world integration and modernization processes in the field of education, intercultural dialogue, mutual understanding between nations and regions of the world. Continuing its glorious traditions and multiplying its achievements, 2017 is an anniversary year. The 80th anniversary of our Alma Mater is an indicator of the achievements of scientific schools and dynasties of scientists, our graduates and students. Looking confidently into the future, we realize that we are destined to become a symbol of courage, sustainability and unity of the academic community. The path that our University is pursuing is a reflection of the inextricable connection between generations, the heroic history of our country and the irresistible aspirations for freedom. What comes next – the implementation of the Development Strategy – 2025 and the gradual realization of small and very responsible steps. NOMEN EST OMEN! 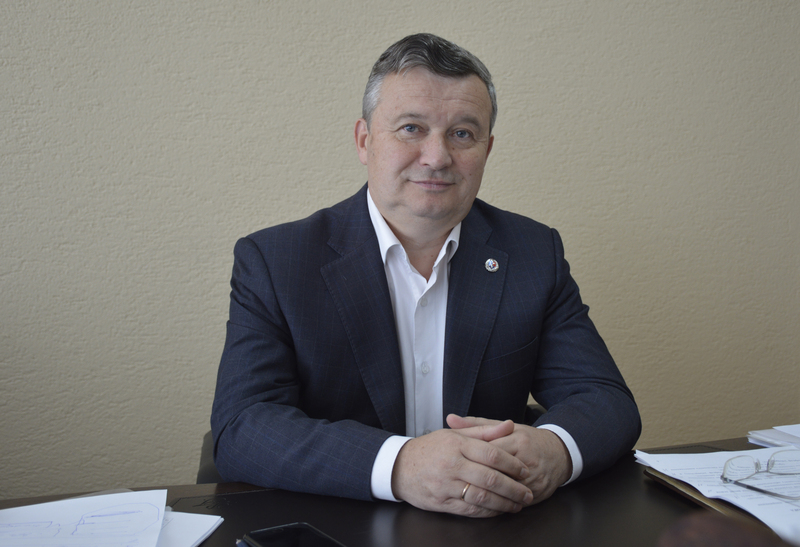 Rector of Vasyl’ Stus Donetsk National University, Head of the Department of Constitutional, International and Criminal Law, Doctor of Law, Full Professor. Grynyuk Roman Fedorovich was born on October 5, 1960 in Svirsk (Russian Federation). In 1981 became a student of the full-time department of the Donetsk State University in the specialty “Jurisprudence”. After graduation in 1986 he worked at the university in public positions and from 1990 – as a senior lecturer in the department of law, from 2001 – an associate professor of the department of constitutional and international law, since May 2007 – a professor of this department, from 1 September 2007 – Head of the Department of Constitutional and International Law, and from October 1, 2008, – Dean of the Faculty of Economics and Law, from 2014 – Dean of the faculty of law and head of the department of the Donetsk National University. In 2001 he defended his Candidate’s dissertation, in 2002 – he was awarded the title of senior lecturer. In May 2007, he defended his doctoral dissertation at the Yaroslav Mudryi National Law Academy on the topic “Theoretical model of the rule of law and the problem of its implementation in modern conditions.” In December 2008 was awarded the title of full professor at the Department of Constitutional Law. In November 2012 was elected as rector of the Donetsk National University. The rector continues building an academic career. The main lines of his research are the theory of state and law; constitutional and municipal law. He is a member of the Ukrainian Bar Association, a member of the specialized Academic Council at the Institute of Economic and Legal Studies of the National Academy of Sciences of Ukraine; a member of the editorial board of the academic journals “Вісник Донецького університету”, “Правничий часопис Донецького університету”, and also the Collection of scientific studies of the Institute of economic-legal research of the National Academy of Sciences of Ukraine “Problems of Legislative Provision of Economic Policy”. The Rector is the author of more than 60 scientific and 50 teaching and methodological works, including two personal monographies: “The Legal Status of Utilities in Ukraine”, “The idea of a legal state: The Theoretical and Legal Model and Practical Implementation”. The Rector is a co-author of a number of scientific equipment, a co-author of Monographs in two volumes edited by O.V. Skrypnyk (Volume 1. Civil Society in the Political System: Theoretical and Methodological, Constitutional and Legal Aspects of Research. “” Volume II, The Legal and Democratic State in the Political System: State, Trends and Prospects for Development “). The team was awarded the Yaroslav Mudryi Prize (2011). Vice-rector for Strategic Development and Innovation. Doctor of Political Sciences, Professor. Vice-Rector for Scientific Affairs. Doctor of Economic Sciences, Professor. Vice-rector for International Affairs. Doctor of Economic Sciences, Professor. Vice-Rector for Administrative and Economic Affairs. Dear friends, I would like to extend cordial congratulations on the occasion of the International Students’ Day, which is celebrated by progressively-minded people on November 17th! My congratulations are not only for people who are studying today at the Vasyl’ Stus Donetsk National University, but for people who work in the walls of our glorious university as well, because we were all students one day. We remember this unique stage of life very clearly – the period when the path of our future life is being built, the personality of a person and a specialist is being formed. Our present success in many ways is the merit of the older generation: professors, mentors, teachers. We can confidently move forward only with the help of accumulated and cherished experience, traditions and available knowledge. And may this unity and continuity of generations never disappear over the years, and let us aim this inexhaustible energy at creating a better future of our dreams! Student community is a state of mind! And our team of teachers and employees know this very well. But first and foremost the 17th of November is a students’ holiday — a holiday which concerns all the students from freshmen who just joined the University family to already experienced graduates of the current year of study who almost ready to leave the walls of Alma Mater. I hope that each of you understand and appreciate the benefits the status of being a university student. Being student is definitely interesting – the mad pace of life, a lot of activities, various projects and meetings are waiting for you every day in the classrooms of the university, and beyond. Being a student is useful as Higher education opens up new horizons of professional development, guarantees interesting opportunities and broadens the circle of communication. Being a student demands responsibility – the society requires a high level of intelligence, profound knowledge, breadth of knowledge and communicative abilities from high school students. Such factors as the information age, innovative approaches and the modernization of all spheres of life make us continually increase our level of knowledge and not lose the motivation to study throughout our lives. I am sure that at our university you will definitely find friends, develop leadership skills, learn how to think professionally and make the right decisions. I hope you will realize yourself in different ways – in research and community activities, volunteer and cultural projects, sports, or art. I am fully sure that you will successfully perform your talents, multiply the cultural and spiritual heritage of many previous generations and establish the authority of the Vasyl’ Stus Donetsk National University in Ukraine and worldwide. Let the student’s days forever remain in your memory as a time of knowledge and accomplishment and your youth and talent guarantee a beautiful future. I wish you to develop your creative potential successfully, because the decision on what life in our country will be in the future is up to you. We are able to bring stability, peace and prosperity to Ukraine only by uniting our efforts. I am sure that each of you will take a place in our society, worthy of recognition and respect, worthy of the status of a graduate of the Donetsk National University! Again, take the sincere congratulations on the occasion of the International Student’s Day – the holiday of the young, relentless to study and creative people! On this sunny fall dayday, take the warmest congratulations on our professional holiday – the Day of the Education Worker! We call the profession of a teacher a special vocation, and one has to agree agree with it. You faithfully carry out your professional duty by making a heroic act every day in the name of Ukraine. At the time of the war, the wisdom and sacrifice of the educator – the teacher, whose efforts are the future of all our state, become incredibly valuable and fateful. You are fulfilling your duty no matter the cost, you have always been and remain the main light in the life of your students, giving them the warmth of your hearts and the treasures of your knowledge. You are making a great contribution to the development of Ukrainian education, forming a new generation of professional practitioners and scholars, giving each young person an invaluable treasure of high education, spirituality and the desire to change his life and destiny of Ukraine for better. Accept sincere gratitude for the high service, professionalism, endurance and dedication! On this festive day I sincerely wish you dear colleagues good health, warmth and peace of mind, well-being and great creative success. May the educational field nurtured by the tireless work bring up new talents and generations of true citizens and specialists in their cause. I wish you sincere joy, inspiration, new pedagogical achievements for the sake of the bright future of our Motherland! Greetings from Roman Grynyuk the Rector of the Vasyl' Stus Donetsk National University on the completion of 2015-2016 academic year. Another academic year has passed. I sincerely congratulate all students, colleagues and partners with its successful completion! It is very soon when graduates will receive diplomas and we will observe their vital and professional growth. Today we graduate those who saved and restored the life of Alma Mater in exile from the time of the relocation. I remember this and thank heartfeltly to each of you. Let the fate be for you on a life’s journey! The 2015-2016 academic year was difficult for us, but a number of victories proved that the university is moving in a right direction. This means that we ganed trust from entrants, local community, domestic and international partners. The result of such trust and support was the continuation of the project of the International Renaissance Foundation “European Development of the Donetsk National University in Vinnytsia – 2016”. This year we have successfully overcome the extremely complicated and painstaking process of accreditation of all specialties, which are preparing qualitative specialists in DonNU. As a result, our University was honored as the best university in Central Ukraine. 2500 enrollee have made their choice in favor of the DonNU this passing academic year. As a result of prospective development of the University in the field of science – the Science Park “DonNU – Podillya” has been created. The Council of Rectors of Migrated Higher Education Institutions offered a number of key proposals aimed at solving the main problems of temporary displaced higher educational institutions, which have already been reflected in the draft laws of the Verkhovna Rada of Ukraine. The strategic achievement was the decision of the team – to give the University the name of Vasyl Stus. Stus University is the next step in the history of our common success and the continuation of the famous traditions of Alma Mater 1937 of birth. This step was supported by the son of Vasyl Stus – Dmytro and the Minister of Education and Science of Ukraine – Liliya Hrynevych, who promised to consider the initiative of our collective in short terms. The reconceive mission of higher education will be the basis of the Strategy for its development, and the Vasyl’ Stus University itself will become a real place of productive coexistence of science, education, business and public practice. Together with dmittion campaign, vacations, leave – new challenges are ahead. I wish all members of our great university family Faith and Peace a great rest and inspiration for new successes and genuine achievements! I heartily congratulate you on the Independence Day of Ukraine! This day makes us think over the past and think about our future in a free, rich, blooming and independent Ukraine, where children’s laughter and flowering garden under the peaceful sky grant us confidence and well-being. The past years have shown at what cost we are given this freedom. Let us remember and thank those who have gained this independence and strengthens the faith in our unity and universal values of our nation today. We are expressing deepest gratitude and cherish the memory of those who gave their lives and health for our homeland. I am sure that Ukraine is a state of promising and successful people! Let each one of us embrace the freedom, do good deeds, support the weak, open up opportunities to the young and honor the elderly. Let the dignity of the Cossack family be reflected in our actions and thoughts! I want to wish you and your families good health, peace, harmony, well-being and prosperity! The most difficult academic year in the life of our university is over. I want to thank each of you who remained faithful to our Alma mater, who helped not only to revitalise it in a new place, but also did everything possible that we steadfastly stepped up to European standards of education while preserving our own. I appeal to you. I think you have already been able to appreciate how high-level our university is and you prospects with us. We are waiting for you and assure that by taking you to the ranks of our students we will fulfill all our obligations. You will receive a classical world-class education and European-style diplomas. Donetsk National University is waiting for those students who want to resume their studies or transfer from other universities. Starting from September 1, 2015, our university will work in full time, so please contact the faculties and social and educational department on settlement issues in the coming year. This applies to both to students and university staff. We have successfully passed the challenges and will have a qualitative admission. We have high potential to work in the next year in favor of Ukrainian and world science. We are starting a new academic year in the city of Vinnytsia on the third of November and this is the great merit of our friendly team. Thank you ever so much! I would also like to say some additional words of gratitude to our colleagues from Vinnytsia who supported us in a difficult time. We understand that in the new working conditions we will face new challenges and difficulties, but we will definitely overcome them. I wish peace to all of us, patience and faith in our strength! Everything will be fine! Dear first-year students of the Vasyl’ Stus Donetsk National University! In these difficult times that our Alma Mater is experiencing, standing on the positions of statehood and professional dignity of educators and scholars of Ukraine, you all are the lighthouse that leads the future elite of the Donbas and Ukraine to global opportunities, without losing the national spirit. Let us congratulate and thank you all for the confidence and support of the Donetsk National University, the one of the best universities in Ukraine, with a 77-year history of international activity, cooperation with educational institutions and research institutions in the world. You are now students of the Donetsk National University of the Ministry of Education and Science of Ukraine! As a result of your fruitful work, the indifference of parents and teachers you are now posses this status. The change of the legal address of Donetsk National University is compulsory and temporary. In order to obtain a scholarship, a state-recognized diploma with international recognition applications (in the US, Europe, Russia and the post-Soviet area) and obtaining knowledge from the best professors and associate professors – academics and lecturers – you should register on the website of the Ministry of Education and Science of Ukraine by October 15, 2014. After this procedure you will be regirtered as students of DonNU. After the registration undergraduate students of Bachelor’s Degree should expect a telephone call with a notice of the studying schedule, which will begin on November 3, 2014. First-year students of the Specialist’s and Master’s Degree will begin their first semester with a predegree practice. Accordingly, during November and December 2014, you will co-operate with the thesis adviser on the clarification of the topic, the data collection, the preparation of abstracts or articles on the main provisions of the qualification work of a specialist and master’s degree. The winter session for all courses will take place at the new legal address of DonNU. For the first-year students of the Bachelor’s Degree program, it will include tests and examinations for the semester subjects. For the first-year students of the Specialist’s and Master’s Degree program it wiil include reporting on a predegree practice and preliminary thesis defence. We are sincerely glad to welcome you in the heart of the ukrainian studentship and friendly university family. We look confidently in our future and together we will work on reviving the spirit of the Donetsk National University in exile. Dear colleagues, students and postgraduate students! In these difficult times I think it is necessary for each of us to state the position regarding the future of Donetsk National University. There were many challenges during the time of my rectorship such as constant struggle with the state treasury, litigation and personnel recapture of the collective of the Donetsk National University. Today we are undergoing a new challenge of persistence, loyalty to academic values and national dignity. The sense of responsibility to the DonNU team and my own state positions caused my support and implementation of the initiatives of the Ministry of Education and Science of Ukraine to change the legal address of the university and restore its functioning in Vinnytsia. In this way, we will be able to preserve the glorious name of the Donetsk National University as one of the best Ukrainian universities. I am convinced that this situation is temporary. We will definitely return our infrastructure in Donetsk, continuing the traditions and glorious history of many generations and dynasties. The University is first and foremost our students. I am pleased to announce the positive dynamics of the registration process of students and postgraduates of all specialties on the MES website. I would also like to express the words of gratitude to those students who are contributing today to the restoration of the activities of DonNU on our Ukrainian land. In these difficult times we especially appreciate those who glorified tha name of DonNU in the world, strengthened the country’s elite, who brought their children and grandchildren here. We are also thankful to those people who could remain invincible, faithful to science and the university and Ukraine. Challenges always assume choice and loss. Under the current conditions the Donetsk National University left those who did not pass the test of national and professional dignity. Now we are beginning a new stage of improving the glory and honor of DonNU. The Academic Council of the University is a collegiate body of the University which is created in an amount of up to 54 members to address the main issues of the collegial life in accordance with the Regulations, approved by the rector. The Academic Council of the University is working on an approved plan. Meetings of the Academic Council are held at least once a month. The term of office lasts five years. The Academic Council of the University may delegate part of its powers to the Academic Councils of the Faculties in accordance with the current legislation. The Academic Council of the University is headed by its chairman, who is elected by secret ballot from the members of the Academic Council who have a degree and / or academic (honorary) title, for the term of the Academic Council. The Vice-Chairman of the Academic Council of the University is elected by secret ballot from the members of the Academic Council who have a degree and / or academic (honorary) title for the term of the Academic Council. The secretary of the Academic Council is the academic secretary of the university. The Academic Council of the University consists of rectors, pro-rectors, deans of the faculties, academic secretary, director of the library, chief accountant, heads of self-government bodies and elected bodies of the primary trade union organizations of the university staff, as well as elected representatives to represent scientific, scientific and pedagogical workers. They are selected among the heads of departments, professors, doctors of philosophy, doctors of sciences. The Academic Council of the University also includes elected representatives representing other university staff that work on a permanent basis, elected representatives of graduate students, doctoral students, the leaders of the elected bodies of the primary trade union organizations and graduate students, leaders of the student government, according to quotas determined by the University Statute and Regulations of the Academic Council of Donetsk National University. No less than 75 percent of the Academic Council should be academic, scientific and pedagogical staff of the University and no less than 10 percent – elected representatives from the number of students. Elections to the Academic Council of the University begin 30 calendar days before the expiration of the powers of the previous membership of the Academic Council. The personal membership of the Academic Council of the University and its changes are approved by the orders of the rector. Members who terminated the labor relations with the University are dismissed from the position in the Academic Council; as well as members who submitted a reasoned statement of withdrawal from the membership to the chairman of the Academic Council. Decisions of the Academic Council of the University are put into effect by the order of the rector.